I’m trying hard to put out more dinosaur videos for you guys. In February I gave you The Dinosaur ABC which took me forever to make with all the green screen work and editing. This month I have a video which was way easier to make but it sure took some time. I’m sure you’ll have a great time watching it. Can a Brachiosaurus really drive a car? Well, the song called “The Old Brachiosaurus” tells the story of an old, weary dinosaur who secretly dreams about owning a car and going round the world. It’s actually the opening track on my kids album debut “Dinosaur Songs” and even though I’ve heard it a thousand times, I still love the song. I usually don’t play it live, but last month I did a sold out show at the old theater in Kalmar and I decided to play “The Old Brachiosaurs” and have some fun with the audience. I normally don’t have any other musicians or actors on stage with me and I don’t use people in dino suits (once I start doing that there is no going back to one-man shows). But for this show I wanted to surprise my fans. I bought an RC car and had my oldest son sit at the side of the stage operating the car with a remote. When I got to the part where I sing “I really wish I had a car” my son made the RC car go out on the stage to everyone’s delight. 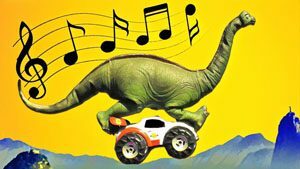 I put the Brachiosaurus on the car and played the rest of the song as the Brachiosaurus drove around the stage. It was hilarious! I quickly realized I wanted to make a music video with the Brachiosaurus and the car. So I brought both the car and the brachiosaurus on tour with me and started shooting video in different places all over Sweden. It was great fun and people who saw me recording always had a laugh. Sometimes people would stare when they saw an adult man playing with an RC car that had a huge dinosaur mounted on the roof. It was also a really reckless driver and often tested the limits of what the car could handle. It made it drive down slides, rocks, big piles of sand and other strange places to gather some cool footage for the video. I had to cut out so many funny clips of the brachiosaurus crashing. If this dino video becomes popular, perhaps I I can put all those clips togeher for you some day in a follow-up music video for the kids. Well, enought talk. Here is the video. Hope you like it. At the time of its discovery in 1903, Brachiosaurus was declared the largest dinosaur ever, but other sauropods are now believed to have been much bigger and heavier than Brachiosaurus. Paleontologists once believed that Brachiosaurus lived mostly in the water, due partly to its nostrils being at the top of its egg-shaped head. But this likely was not the case for several reasons. For one thing, sauropods had air-filled pockets inside their bodies, which would have made them quite buoyant and unstable if they entered deep water, according to a 2004 study in the journal Biology Letters. Unlike most other other sauropods, Brachiosaurus had long forelimbs that caused its back to incline. If its neck exited its body in a fairly straight line, as is currently believed, this would have resulted in it pointing upwards, though the exact angle and flexibility of its neck continues to be debated. This entry was posted in Dinosaur Songs, Dinosaur Video, Music video for kids, Youtube and tagged brachiosaurus, brachiosaurus car, brachiosaurus driver, brachiosaurus song, dino, dino song, dino video, dinosaur song, dinosaur songs, dinosaurs, the old brachiosaurus on April 21, 2017 by Daddy Donut.